I've written before about how hit or miss Neil Gaiman is for me. I didn't love Neverwhere or The Children's Crusade. I did love Trigger Warning and was on the fence with Black Orchid and The Ocean at the End of the Lane. My book club buddy, Rachel, had loaned me her copy of The Dream Hunters a bazillion years ago because she thought it was closer to my style than some of his other works. 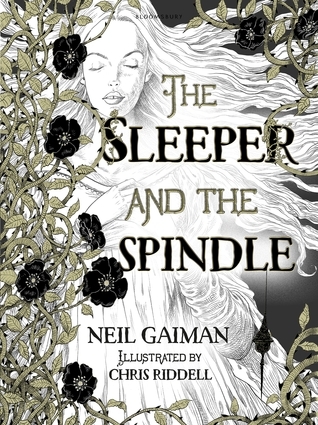 I also saw a copy of The Sleeper and the Spindle at my library and snatched it up due to its similarity - another retold folk/fairy tale. 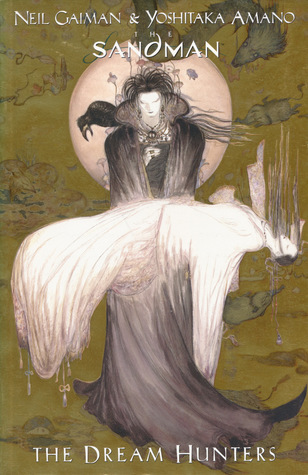 Following in the tradition of Japanese folk tales, this story is illustrated by legendary Japanese artist Yoshitaka Amano, designer of Final Fantasy, who adds a new dimension to the character of Morpheus with his spectacular renderings. Formatted as a text piece with illustrations on each facing page, "The Sandman: The Dream Hunters" is a tale centered on ill-fated love and dream-eating monsters. While it's true that my book club isn't traditional, what I love about our format - where we each choose what we want to read based on a theme - is that we've gotten to know each other's taste so well. Instead of just seeing what people like or don't like from a single book, we see what they would choose given any option. I think it leads to us really knowing what everyone likes - and clearly Rachel was on her game when she gave me The Dream Hunters. Both of these books are just gorgeously illustrated, but the story is what shines the most. I love graphic novels and comics, but I'm usually paying more attention to the art than I am to the story. Good art can save a bad story. In this case, however, despite the gorgeous art, I was drawn into the characters and their relationships and where they went rather than the art primarily. I don't want to insinuate that there are problems with the art in either book - both are so original and could not possibly fit the story and style of each story more perfectly. But there's just something about the way Gaiman does fairy tales that draws me in. I highly recommend taking the time to find both of these and making them a reading priority. They are both short and, obviously, graphic format, and can be read quickly, although I think you'll find that you want to go slowly and savor both the art and the storytelling. I've returned my borrowed copy to Rachel and to the library, but I'll be looking for my own to have on my shelf.